Happy WIAW! How's everyone doing this week? 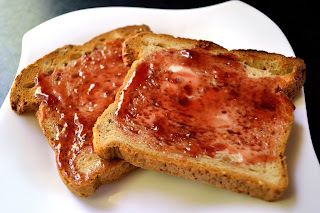 Well, today I'm going to share some of my favorite quick, simple, and cheap gluten-free, vegan foods to show that you don't have to break the bank or eat all kinds of crazy, fancy, hard-to-find ingredients to follow a plant-based diet. On top of that, usually by the middle of the week, I'm not in the mood to cook for hours on end when I get home from work, so I'm all about finding quicky and easy meals that are still healthy and delicious. So let's get my food for today going, followed by one of my favorite "quick, easy, and cheap" recipes: "Spaghetti with Meatless Meat Sauce". with Earth Balance butter and organic strawberry jelly. Workout: 1 hour on the treadmill, my favorite kind of intervals: run 2 minutes, walk 1 min. (aka a "Snickers Bar:" as I call it!). Just got home/Playing with Avery Snack: "Peachy Kale Smoothie"
Fueling up on her green smoothie before playing. Dessert: 2 Gluten-free, vegan cookies from Cinnamon Quill. 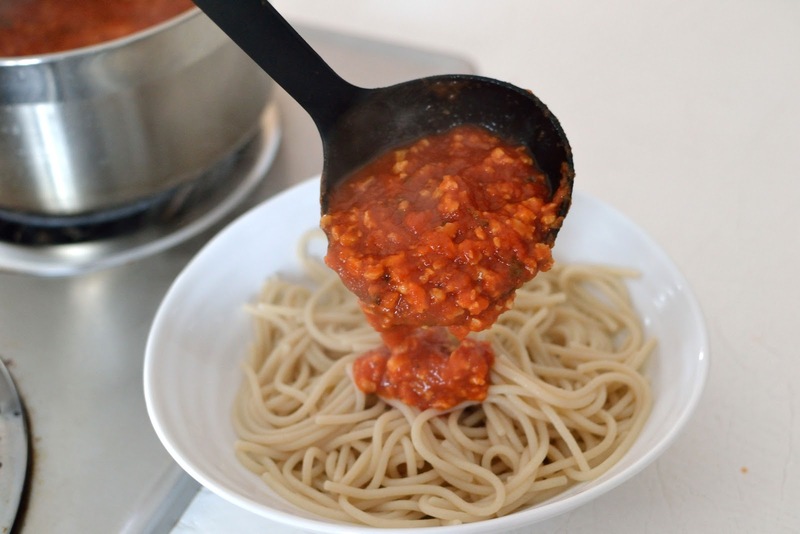 Okay so now that you know what I ate today, let me share one of my favorite quick, easy, cheap, and healthy vegan dinners: Spaghetti with Meatless Meat Sauce. First up, let's talk about it's main ingredient: TVP (or it's real name: Textured Vegetable Protein). Sounds kind of strange right? Don't worry, it's just "defatted soy flour" that has been cooked under pressure and then dried. Still confusing...bear with me! 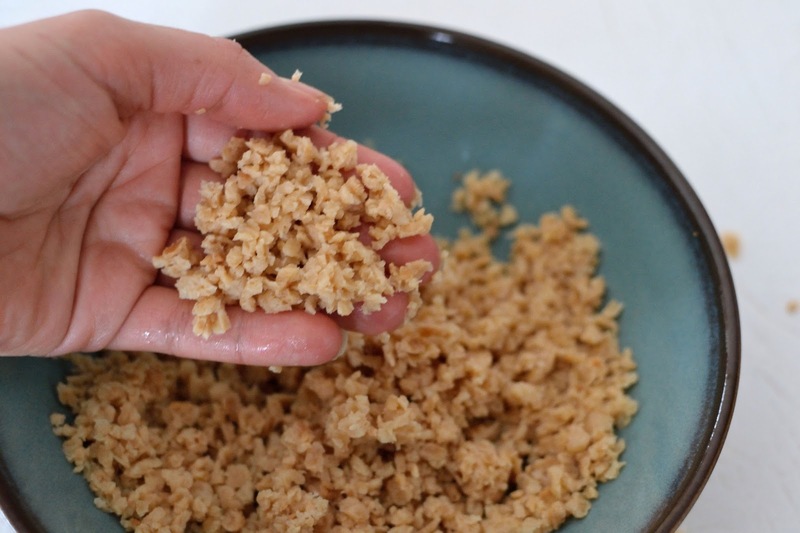 It comes in a granule-type form that looks a bit like oatmeal and when liquid is added to it, the granules "re-hydrate" and take on a texture similar to ground beef. Ever tried a meat-replacement like a Boca Burger or Morningstar Farms hot dog? Well, you can pretty much bet that one of the main ingredients in those "meats" was TVP. With that in mind, one benefit of using plain TVP is that we're cutting straight to the source! Instead of pretend "meat crumbles" with a long ingredient list (that usually includes wheat- a "no no" for me) I stick with plain ol' TVP to give me that reminesencet ground beef texture, minus all the extra sodium and preservatives. Health benefits of TVP: high in protein, virtually no fat, high in fiber, iron, magnesium, and phosphorus. Other benefits of TVP: it's cheap! A 10 oz. pkg online costs about $3 here or you could find it at your local health food store for pretty close to that price as well. I've even seen it at Wal-Mart! Now by using a 1/2 cup per meal (the amount called for in this recipe) you could get about 6 meals out of that one cheap little bag! That's 50 cents per meal...quite a savings since 1 lb of ground beef or turkey would probably cost you about $1.75 or more. Sweet! 1. Measure out 1/2 cup TVP into a bowl. 2. 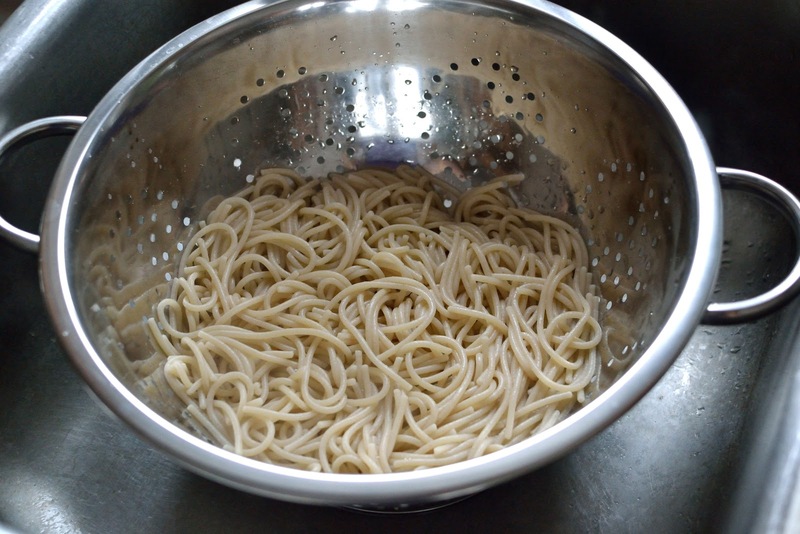 Bring water to boil in a large stockpot for spaghetti noodles. measure out 1/2 cup of the boiling water. 1/2 cup TVP, 1/2 cup water). or paper towel over the TVP until no extra water remains. prepare to serve it right onto the noodles. Anyone else ever cook with TVP? What do you think of it? Share below! 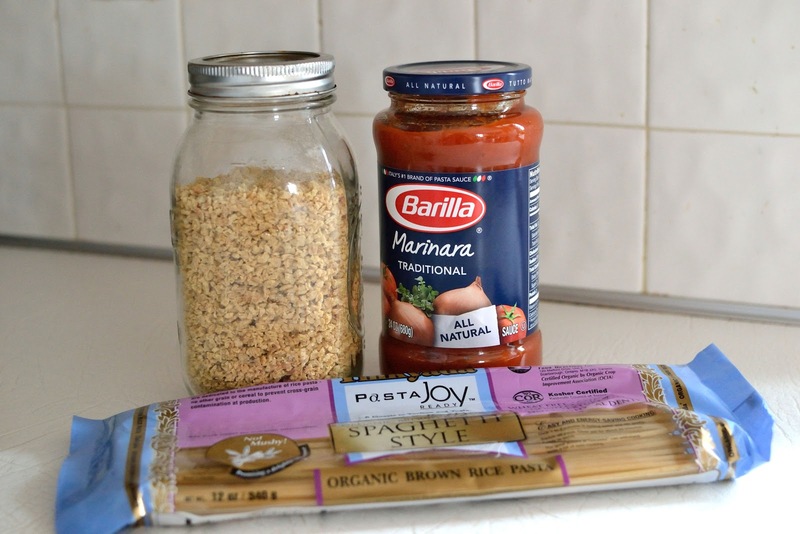 I'm not quite ready to try the TVP but I thought I would share a little money saving tip for spaghetti sauce. With a can of crushed tomatoes and a can of whole (chopped) or diced, half an onion, 2 cloves of garlic (saute the onions and garlic in the pan first before adding the tomatoes)and then your favorite italian seasonings (I use parsley, basil, oregano and some garlic and onion powder and salt and pepper), you can make a delicious homemade sauce in the same time it takes you to cook you pasta. The tomatoes are about 50 or 60 cents a can so you are saving money on the jar sauce and you can control the seasonings. Anyway, just thought I'd share! :) Your little Avery is a super cutie, by the way!! TVP is so great. I don't know why more people don't cook with it. I use it to make faux-chicken tacos all the time. And your meatless sauce looks great. I love the texture of meat sauce, so this sounds right up my alley. sorry for the delay in replying to you, I've been trying to utilize the new Blogger feature "threadded commenting" where I could reply to each of you individually, but I simply cannot get it to work! Grr! This "meat sauce" is very Bolognese-esque! Hope you like it! Glad to find another TVP fan! Although I've had TVP with pasta, in Sloppy Joes, and even in chili, I've never had it on tacos...what a great idea! Gonna have to try that one. 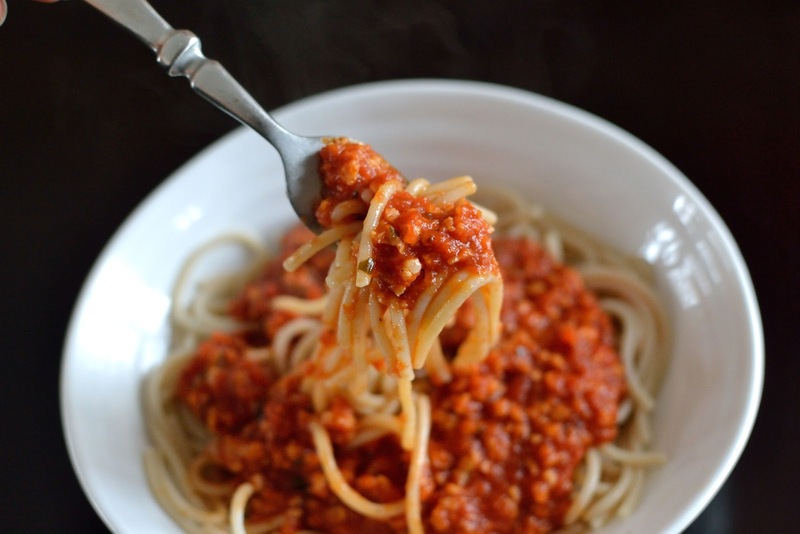 I also love the texture of meat sauce, as it makes boring pasta and sauce not be so boring! Hope you like it. I love home made pasta sauce, but have never attempted it on my own! Thanks for sharing the recipe...your post has made me brave enough to try! Have you heard about the zero waste family??? The mother also wraps her presents in cloth :) Here are her two sites; one has a lot of neat videos/tour of her home and tips for having zero waste in each room. She uses cocoa powder for blush/bronzer which I thought was the most ingenious idea ever! http://thezerowastehome.com/ is the blog and http://www.sunset.com/home/natural-home/zero-waste-tips-00418000074253/ features the videos and more tips. You've probably already seen it, but if not thought you would really enjoy it! Thanks for the tag, I'll have to get around to posting my answers to your questions! Also, I hadn't heard of the zero waste family until you told me about them. So cool! Cocoa powder for bronzer is ingenious, I've gotta try that! Thanks for sharing, I'll have read up on their tips.